The Taconic Mountains or Taconic Range (/təˈkɒnɪk/) are a physiographic section of the larger New England province and part of the Appalachian Mountains, running along the eastern border of New York State and adjacent New England from northwest Connecticut to western Massachusetts, north to central western Vermont. The range includes notable summits such as Mount Equinox and Mount Greylock, the highest point in Massachusetts. Currently local residents, consistent with the prominent 19th century geologist, T. Nelson Dale, consider the Mount Greylock Massif as a subsidiary of the main Taconic Range to the west. The Taconic Range is known for its ecological value, conservation land, scenic landscapes, natural environment, and recreational facilities. It contains several hundred miles of trails including sections of the 2,175-mile (3,500 km) Appalachian Trail and over sixty designated areas of land protected by federal, state, county, and municipal, government agencies and non-profit organizations. The range has been targeted for conservation by government agencies in four states, the federal government, and over a dozen non-profit organizations. Multiple government and non-profit conservation partnerships have been formed with the intention of conserving the Taconic landscape and ecosystem. "Taconic", a Native American name, was once transliterated as the Taghkanic or Taughannock, meaning "in the trees" and used as the name of a Lenape chieftain. Taghkanic is still used in parts of eastern New York, as in the name of a small town in the region, for both features within and outside the Taconic Mountains region. The Taconic Mountains begin in northwest Connecticut and northeast Dutchess County, New York. They extend through western Berkshire County, Massachusetts and the adjacent counties in New York, then along the border of New York and Vermont to the town of Brandon, after which they lose prominence and dwindle into scattered hills and isolated peaks which continue north toward Burlington, Vermont. To the south, they fade into the Hudson Highlands range in New York. Beginning in New York State, a 12-mile (19 km) wide region of foothills gradually rises to the crest of the Taconic Mountains along the state's eastern border. To the east, the Taconic Mountains fall off abruptly, ending in the valleys of the Housatonic River, the upper Hoosic River, and the greater Valley of Vermont. The Berkshires and the Green Mountains rise to the east of the Taconics. To the west, the Taconic foothills are bordered by the Hudson River Valley and, near the northern terminus of the Taconic Mountains, they are touched on by the eastern foothills of the Adirondack Mountains in Washington County, New York. Mount Greylock with its glacial cirque, the Hopper, is geologically part of the Taconic Mountain Range although culturally associated with the Berkshires. In Massachusetts and Connecticut, the Taconic Mountains are often popularly grouped as part of the Berkshires; in Vermont they are similarly grouped as part of the Green Mountains. However, the Taconic Mountains are geologically distinct from the Berkshires and Green Mountains. The highest peaks of the Taconic Mountains are Mount Equinox 3,816 feet (1,163 m), located in Manchester, Vermont, Mount Greylock 3,491 feet (1,064m) the highest point in Massachusetts, and Mount Frissell 2,454 feet (748 m), the highest point in Connecticut. The Taconic Mountains lie within the New England-Acadian forests ecoregion. Because the Taconic Mountains are geologically related and contiguous with the Hudson Highlands, the southern boundary of the Taconics is difficult to define. Some notable South Taconic peaks include Mount Frissell, the south slope of which contains the highest point in Connecticut at 2,379 feet (725 m); Bear Mountain 2,326 feet (709 m), the highest mountain peak in Connecticut; Alander Mountain 2,239 feet (682 m) and Brace Mountain 2,311 feet (704 m), Mount Everett 2,624 feet (800 m), the highest point in the South Taconic subrange and the home of an upland pitch pine and scrub oak biome; and Mount Fray 1,893 feet (577 m), home of the Catamount Ski Area. Bash Bish Falls, reputedly Massachusetts' highest waterfall, is located in the South Taconic Range. The Appalachian Trail traverses the eastern escarpment of the range; the 15.7-mile (25.3 km) South Taconic Trail traverses the western escarpment. Several miles to the east of Harvey Mountain is Yokun Ridge, a well defined 9-mile (14 km) long ridge extending from the Massachusetts Turnpike to the southerly neighborhoods of Pittsfield at elevations ranging between roughly 1,500 and 2,000 feet (460 and 610 m). The ridge contains an area designated The Stockbridge-Yokun Ridge Reserve by the U.S. Forest Service and thus eligible for certain conservation easements. At Pittsfield, the crest shifts west once again to hills contained within Pittsfield State Forest: Balance Rock Park and Bates Memorial State Park, where heights include Holy Mount 1,968 feet (600 m), once the location of religious rituals practiced by a former Shaker community and Berry Hill 2,200 feet (670 m), notable for its extensive stands of wild azalea. North of Jiminy Peak 2,392 feet (729 m), the valley of Kinderhook Creek cuts through the hills. Here the westernmost ridgeline is dominated by Misery Mountain and Berlin Mountain 2,818 feet (859 m) and extending into Pownal, Vermont; the easternmost, which terminates in Williamstown, Massachusetts is ruled by Mount Greylock 3,491 feet (1,064 m), the highest point in Massachusetts. Between these is the long ridge of Brodie Mountain. The area hosts three long distance trails (the Appalachian Trail, the Taconic Crest Trail, and the Taconic Skyline Trail) and an extensive network of smaller trails. North of the Massachusetts border, the profile of the Taconic Range is cut and eroded by the Hoosic River as it turns west and then south toward its confluence with the Hudson River, and by its tributary rivers in the vicinity of Bennington, Vermont. Mount Anthony 2,320 feet (710 m), notable for its caves and as the location of Southern Vermont College, stands as a satellite peak above the surrounding eroded terrain. North of Bennington, the range gradually rises to its highest prominence with peaks such as Mount Equinox 3,850 feet (1,170 m), the high point of the Taconic Mountains, and Dorset Mountain 3,770 feet (1,150 m), a New England 100 Highest list summit. Other notable summits include Grass Mountain 3,109 feet (948 m), a New England Fifty Finest list mountain; and Mount Aeolus 3,230 feet (980 m), the location of several defunct limestone quarries and the site of Aeolus Cave an important bat hibernaculum. Designated hiking trails are located on Mount Equinox, Dorset Mountain, and Mount Aeolus, and several other peaks within the region. Immediately north of Danby, Vermont, the Taconic Range broadens and becomes shorter. It exhibits several parallel ridgelines, dominated to the west by mountains composed of slate and similar rock, most notably the ridgeline of Saint Catherine Mountain 1,200 feet (370 m), with its conspicuous 5-mile (8.0 km) long cliff face visible from Wells and Poultney. The area around Lake Saint Catherine contains extensive slate quarries. The ridgeline to the east, composed of schist and phyllite, is dominated by the 7-mile (11 km) escarpment of Tinmouth Mountain 2,835 feet (864 m), overlooking the Valley of Vermont to the east in the town of Tinmouth. A field of less descript ridges and peaks lies between these two summits. Near the end of the range, in the vicinity of Rutland, Vermont, the Taconic Mountains show several prominent peaks with dramatic, irregular cliff faces clearly visible from U.S. Route 4 west of the city of Rutland; these include Herrick Mountain 2,726 feet (831 m); Grandpa's Knob 1,976 feet (602 m), the former site of the Smith–Putnam wind turbine, the first large-scale electricity-producing wind turbine; and the butte-like Bird Mountain (also called Birdseye Mountain) 2,216 feet (675 m), home of the Bird Mountain Wildlife Management Area and notable as an important raptor migration path and nesting site. Also part of the Taconic Mountains are the foothills of the Lake Bomoseen region west of Birdseye and Grandpa's Knob, notable for their extensive slate quarrying operations. North of Grandpa's Knob, the Taconic Range soon diminishes into scattered hills which extend north into the Burlington, Vermont region. Isolated summits in this area include Snake Mountain 1,281 feet (390 m), a Nature Conservancy preserve featuring a variety of rare and endangered species; and Mount Philo 968 feet (295 m), home of Mount Philo State Park with its mountaintop campground. The Taconic mountain range was formed from the collision of the North American Plate into a volcanic island arc, similar to modern-day Taiwan, during the late Ordovician period, around 440 million years ago. Similar subsequent events built up the parallel mountain ranges to the east. 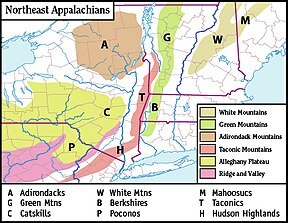 The western side of the Taconics rise gradually from a series of hills in eastern New York to a sharp mountain crest along the west border of the New England states; the east side of the Taconics falls off abruptly where river valleys divide it from the Berkshires and Green Mountains. The total length of the range is about 200 miles (320 km) with a varying width of 5 to 20 miles (8.0 to 32.2 km). The Taconic Mountains are a physiographic section of the larger New England province, which in turn is part of the larger Appalachian physiographic division. Natural resource extraction has been an important industry in the Taconic Mountains; extraction industries have included marble, limestone, slate, and iron mining as well as logging and charcoaling. A narrow strip along the entire Western border of Massachusetts has been designated by the U.S. Forest Service for potential conservation as the "Taconic Mountains Forest Legacy Area" under its Forest Legacy Program. The designated area averages perhaps a mile in width extending east of the state line, but is considerably wider in the southern Taconics region and middle section of Berkshire County. The district in Massachusetts abut parts of New York State and Connecticut that carry similar designations under the federal program, which affords subsidies for the acquisition of conservation easements when available for purchase. The "Stockbridge-Yokun Ridge Reserve was designated as such at a slightly earlier date under the same federal program, which is aimed at close coordination with state and local government authorities. Multi-partner collaboratives that have targeted the Taconic Mountains include the New England Wildlands and Woodlands Collaborative, a regional conservation agenda for the New England states produced by representatives of dozens of non-profits and academic institutions and, more specifically, the Taconic Crest Project, which involves the states of New York, Massachusetts, and Vermont in collaboration with local land trusts and The Nature Conservancy. ^ a b c d e f Raymo, Chet and Raymo, Maureen E. (1989). Written in Stone: A Geologic History of the Northeastern United States. Chester, Connecticut: Globe Pequot. ^ Taconic Physiography by T. Nelson Dale, Bulletin #272, Government Printing Office 1905. ^ a b  "Equinox Highlands, Manchester and Dorset, Vermont." The Nature Conservancy. Retrieved February 13, 2011. ^ a b c Wildlands and Woodlands: A Vision for the New England Landscape. Harvard Forest (2010). Harvard University. ^ a b c South Taconic Range: Trail Guide and Map. Berkshire Natural Resources Council (2002). Pittsfield, Massachusetts.Also available online Archived 2007-06-29 at the Wayback Machine; Retrieved December 27, 2008. ^ "Taughannock Falls State Park" The Paleontological Research Institution: Ithaca, New York. Retrieved January 4, 2009. ^ Lake Taghkanic State Park New York Office of Parks, Recreation, and Historic Preservation. Retrieved January 4, 2009. ^ Collins, Edward Day A History of Vermont, with Geological and Geographical Notes, Bibliography (1903). University of Michigan. ^ a b c DeLorme Topo 6.0 (2004). Mapping software. Yarmouth, Maine: DeLorme. ^ a b Massachusetts Trail Guide (2004). Boston: Appalachian Mountain Club. ^ a b Yokun Ridge (2005). Berkshire Natural Resources Council. Pittsfield, Massachusetts. ^ a b Bomoseen State Park (1989). Vermont Agency of Natural Resources: Waterbury Center, Vermont. ^ (2009) United States Board on Geographic Names. Database entry. . Retrieved February 10, 2011. ^ "Key parcel on Taconic Ridgeline protected" Berkshire Natural Resources Council. Retrieved January 4, 2008. ^ "Welcome to the...Beebe Hill Fire Tower." beebehill.info Retrieved January 4, 2008. ^ Southern Vermont College Retrieved January 4, 2008. ^ "Back Issues of The Northeastern Caver" The Northeastern Caver. Retrieved January 4, 2008. ^ Maizlish, Aaron (2003). "Northeastern US Mountains (New York and New England) Showing Peaks with 2,000 Feet of Prominence" Retrieved January 4, 2008. ^ "The New England Hundred Highest List." Archived 2008-11-21 at the Wayback Machine The Four Thousand Footer Club. Retrieved January 4, 2008. ^ "Local Conservation Projects funded by VHCB." Vermont Housing & Conservation Board. Retrieved January 4, 2008. ^ Hitchcock, Edward(1831). Report on the Geology of Vermont. Harvard University. ^ "Birdseye Mountain Castleton/Ira, VT 1961–1962 to ~1967" New England Lost Ski Areas Project. Retrieved January 4, 2008. ^ "Bird Mountain Wildlife Management Area" (PDF). Vermont Agency of Natural Resources. Archived from the original (PDF) on December 30, 2006. Retrieved January 4, 2008. ^ "Historic Wind Development in New England: Grandpa's Knob" New England Wind Forum: United States Department of Energy. From "Breezin' through History", an article published in the Rutland Herald According November 4, 2004. Retrieved January 4, 2008. ^ "Wildlife Habitat and Public Access Protected on 151 Acres." (29 November 2005). The Nature Conservancy. Retrieved January 4, 2009. ^ Bowman, Isaiah (1911). Forest Physiography: Physiography of the United States and Principles of Soils in Relation to Forestry. J. Wiley & sons. p. 681. ^ DCR Site Help. Mass.gov. Retrieved on 2014-04-12.